When you say a word so many times, it seems to become meaningless. Money feels that way sometimes. And really, the value I want Elliott to see in money is that we don’t need more to feel better and there is so much to value outside of what money can buy. But, that said, I still want him to have a clear understanding of saving money, spending wisely, and caring for others (in a financial sense; other volunteering to care for others is another area we are addressing). So after talking with a friend about an idea from The Simple Dollar I realized that this was what might work better than our current system. Right now, Elliott has decorative piggies who gladly eat his money. And had they been like mine as a child, requiring ‘slaughter’ to get the reward, he might have been more inclined to save for longer. 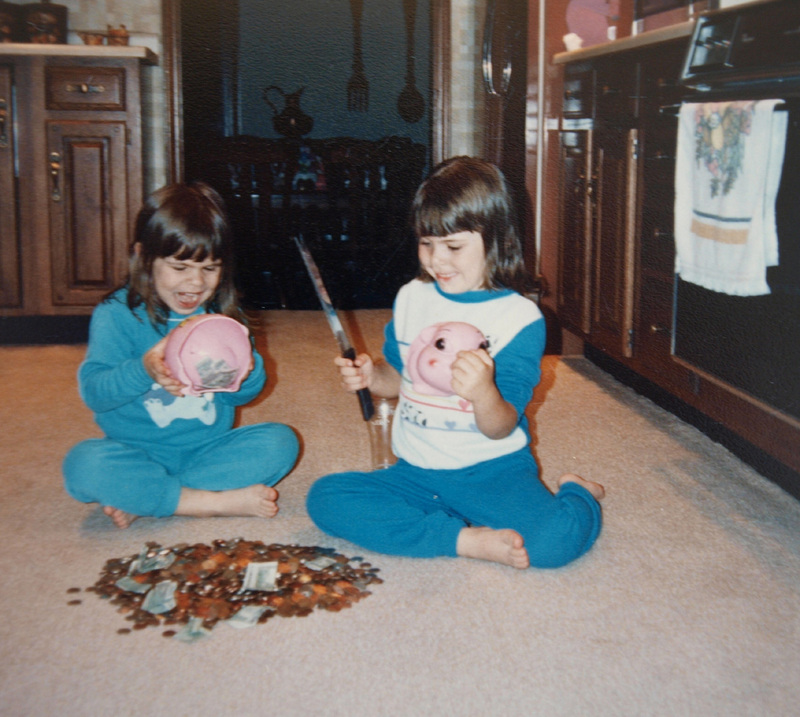 My sister Michelle and I at age 5 1/2 dig into my piggy. Unfortunately (not so in his opinion) the plugs are easily removed on his pigs. As birthday and holiday monetary gifts have been given, he is quick to turn around and want to spend, spend, spend. That money teases and taunts him to spend it, and fast. Nearly 4-5 times a week, I will be asked when we are going to the store and if he can buy something. Even the suggestion of only taking out a few dollars and saving the rest is not working. The very next day after making a purchase, he will ask to buy something again. So, upon hearing this idea, I loved the idea of having separate areas for separate purposes and, being cheap right now, I really liked a comment suggesting merely using jars instead of a new piggy. So today, knowing he already had $17+ begging to be spent, we got four ball jars, discussed the categories and what they meant for him, and prepared the jars. We have 4 categories as suggested – Spending, Short Term Savings (for more special things), Long Term Savings/Investing (into his existing savings account we contribute to or bonds or something to be determined later), and Donation. At first he seemed bothered with donating, but after explaining ways we have given to people previously and options he had, he seemed onboard with that part too. We then divided $3 into each jar, with the rest being put into his ‘Spending’ jar. In this case we allowed a heavier amount to be added to this jar since he just got Valentine’s Day monetary gifts and had been saving this money for a few weeks. 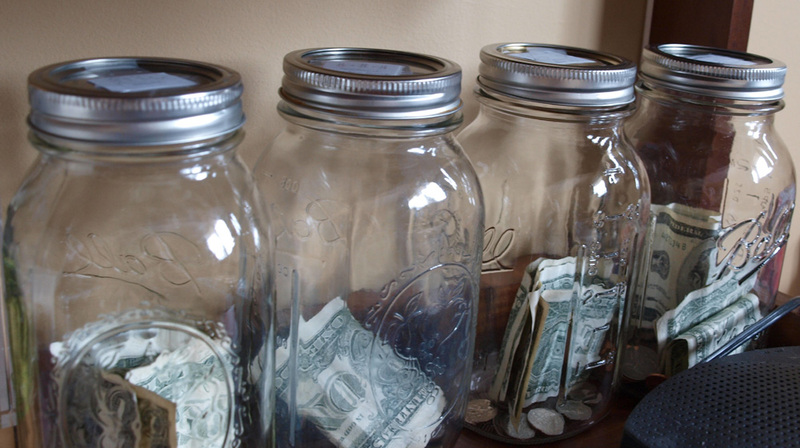 From here on out, his allowance will be $4 a week ($1 for each year old) and $1 will go into each jar. Birthday gifts and other gifts will be his discretion since they are gifts. And I secretly hope he will decide to save some, not just lump it into the spending jar! A parent can hope, right? It is not fancy, but hopefully he will clearly be able to understand the concepts and have a good foundation for managing the money he does have.